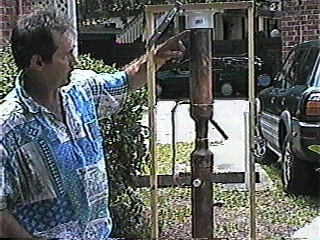 You can make fuel alcohol in your backyard, and many people are doing just that, and running their vehicles on clean-burning alcohol instead of gasoline. If you have been looking for a true reflux still, this is it! Reflux refers to the up and down action inside the still where the alcohol and water vapors are condensing and re-boiling, as it this process that successfully separates out the pure alcohol from the water. There are many still makers out there who say they have a reflux column type still, and they do not even know the meaning of the word! 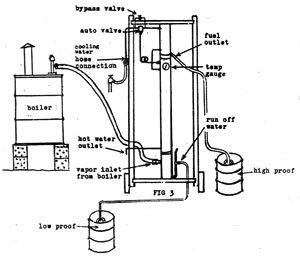 Most of them make the biggest mistake made by many generations of still makers: they have the reflux column and condenser permanently attached (and therefore thermally coupled) to the boiler. This means that the only way to control the temperature (which is what controls how high the proof is) is by means of raising or lowering the temperature of the boiler. Perhaps in a laboratory or in your own kitchen, burning propane or natural gas (and thus, burning fuel to make fuel), this can be somewhat controlled. This works OK for making small amounts of drinking alcohol, but if it is fuel your are after, you want to burn scrap wood, or anything you can get cheap or free as a fuel source, because you have to minimise your costs and also be adaptable. Controlling a boiler pot is a huge bother, and nearly impossible. This is why my still has the distillation column as a separate and easily controlled discreet component. With a pot still, on the other hand, once the beer solution gets hot enough to boil, it starts to boil fast. At this point, a mere 5 degree (F) change in the temperature of the vapors will result in the final product being only 100 to 120 proof instead of 160 to 180 proof. To get high proof ethanol, you have to be able to control the temperature accurately and quickly within a very narrow 1 degree Fahrenheit range. This is only possible if you physically separate the reflux column from the boiler. Secondly, you have to include an automated control method, such as the automated temperature control valve pictured on my still (located just above where my friend has his hand resting on the left side of the still). Most home-made stills you will find on the internet are not true reflux still as there is rarely enough internal surface area or thermal mass to stabilise the alcohol vapors to create the turbulent up and down effect of condensing ethanol dropping down and being reheated by upward vapors and a the same time cooling and stripping the ethanol out of the upward-moving vapors. A reflux column needs to be internally packed with a thermally stable packing material. 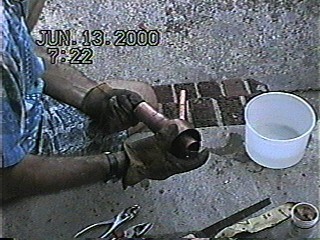 The large reflux columns in a commercial still use ceramic marbles or rashig rings typically. 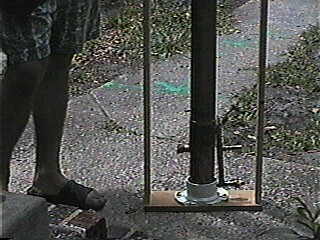 The top section is the condenser section. Robert Warren has built over 140 of these stills, and this design has evolved over many years with quite a few highly skilled engineers assisting in the process. To order the still plans, from anywhere in the world, click on PAYPAL, below, for a secure credit card transaction. As a result of many requests for this hard to find item, we have decided to offer the automatic temperature control valve, in addition to the alcohol still plans. You get blueprints sent by post and 40 pages of detailed instructions and photos sent to you by email. 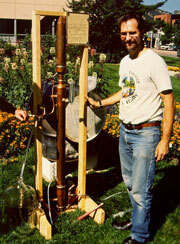 Robert Warren in Boulder running his still. The placard at the top is my BATF alcohol still licence. "I had organized a pretty big energy fair, as part of a larger Renaissance Fair. We invited another ethanol enthusiast to bring over his VW Rabbit, which he had converted to ETOH for a total sum of about $20.00, and we ended up the weekend, filling it with the ethanol we produced at the fair. "I also got someone from the National Energy Research Laboratory to bring over and show one of their $30,000 car conversions: a brand new, fuel injected multi-fuel Chevrolet Lumina, which could run on gas, ethanol, or methanol. "We even had some students from the University of Colorado bring over their photovoltaic racer which had a couple of months earlier participated in the coast-to-coast Solar Challenge. "This particular still is a very efficient design. It has an automatic temperature control valve, and graduated heat loss via internal water cooling, both of which are keys to consistent proof. It produced 180-proof ethanol on the very first run! It can make 5 gal/hour of 160 to 180-proof, which is a great fuel." I called a couple of local breweries, because I had been in the hospital only the week before, so I didn't have time to brew up some mash on my own. Boulder Beer donated 60 gallons of fresh beer, in two 30 gallon plastic drums. 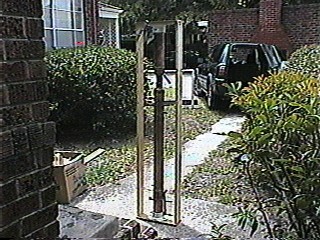 With the help of a friend, I poured 30 gallons into the 50 gallon metal drum which was supported in a cradle made from another 50 gallon drum which I had "carved" with a cutting torch into a convex shape. I had also scooped out huge air holes for the combustion oxygen needed by the big cast iron propane burner I had scavenged from a very old water heater. I also removed the guts of the pressure regulator on the water heater control valve, as I wanted to be able to turn it way up on high because I wanted boiling water, not just hot water. The cutout barrel support stand was set on top of two concrete blocks, as I had to keep the fire and the heat from the burners well off the grass. I had learned this the hard way by leaving a burned circle on a University lawn a few years, before. I also kept two fire extinguishers handy: not so much because I thought I would need them, but I did have to apply for a special permit from the local fire department in order to run the still. It is so crazy how everyone gets so worried about flames near high proof alcohol, when actually, it has a much, much lower flash point than gasoline vapors. Making alcohol is a relatively safe and clean operation. You can't really see it in this photo, but there is a black hose coming from the top of the barrel to the bottom, left side of the still, where the steam vapor enters the still. This is shown on the diagram in the left coumn, though. At the top right of the still, in the picture frame, is the license I received (just in the nick of time) from the Federal Bureau of Alcohol, Tobacco, and Firearms. The 5 gallon glass bottle on the left is where the high proof alcohol is received and stored. Some elses hand is on the garden hose fitting where the cooling water enters the device, and this water came from a faucet on the building 25 meters in back of me, the Boulder City Hall. We made a little under 2 gallons of 180 proof each day, and the total time to do this, from when the beer started boiling, was about 45 minutes. It took a little over 30 minutes to get the water to start boiling. It initially boils at about 85 C, because the alcohol slightly lowers the boiling temperature, but also because Boulder, Colorado is 1,500 meters above sea level. That is a hydrometer laying on the ground, to test the proof of the alcohol. You will need a low proof one for the bear (also called a balling hydrometer) and a high proof one for testing what comes out so you cane make some minor adjustments in the temperature settings. Control the temperature, and you control the proof. It will vary mainly due to ambient temperature: on cold, windy days, you wont need as much water for cooling) and due to the altitude, as mentioned above. The temperature control valve is mounted directly on the front of the wooden support frame, just 30 cm to the right of my friends hand. The water hose is under pressure, and because there is a temperature sensor which leads to a diaphragm on the control valve, it opens and closes very quickly in response to less than a degree C temperature change. If anyone wants to buy a set of plans to build their own still, I will mail them out to you, along with 40 pages of instructions on building and running the still, for $30.00. I am predicting a huge increase in petrol prices in May or June, 2002, due to financial world backlash from terrorism and the War on Terrorism. This is going to have a huge ripple effect in the World economy, and it is likely to seriously effect Asian nations worse than the economic crises of 1997. Prices will remain high for about 6 months, or even longer if Bush starts bombing Iraq. My predictions are based on historical trends, and I am old enough to have seen this happen a few times. (I just turned 50 this year). So, the upside of this will be an increased public interest in ethanol and biodiesel. Sometimes it takes a crises to effect real changes. I just hope it doesn't get too bad, but poor countries are always the hardest hit by such economic hard times. Molasses is an economical product for making your own E85 fuel.